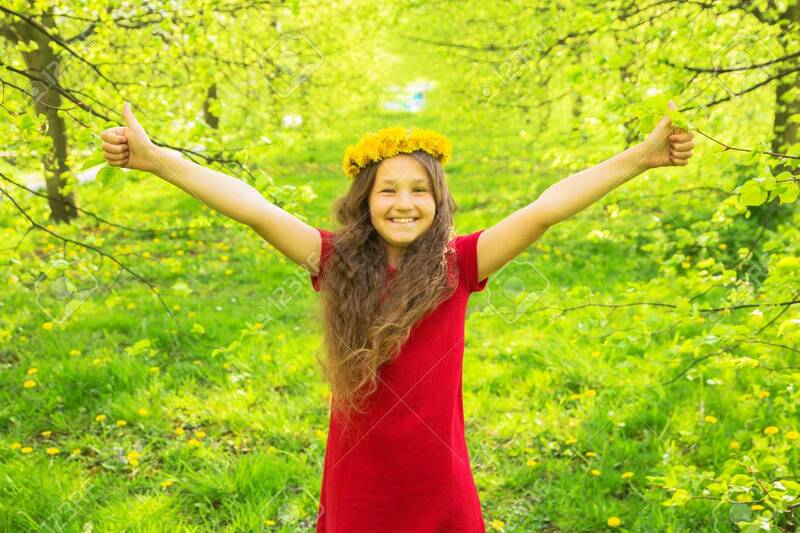 Little Girl In Red Dress And Crown Of Dandelions Showing Thumbs Up Symbol. Smiling Child Gives Thumbs Up Gesture. Joy, Success, Achievements, Vacations, Holidays Concept. Lizenzfreie Fotos, Bilder Und Stock Fotografie. Image 100633644. Standard-Bild - Little girl in red dress and crown of dandelions showing thumbs up symbol. Smiling child gives thumbs up gesture. Joy, success, achievements, vacations, holidays concept. Little girl in red dress and crown of dandelions showing thumbs up symbol. Smiling child gives thumbs up gesture. Joy, success, achievements, vacations, holidays concept.